Last Friday we set off from Taupo to spend the long weekend in Whakatane with family. We didn’t strike too much traffic as we turned off SH1 between Taupo and Rotorua onto SH38, the Te Urewera Rainforest route towards Murapara, and then the Galatea Road towards Whakatane. It’s a good road, and John often prefers this route when travelling to Whakatane, to the alternative route through Rotorua and the lakes. We stopped for lunch at Lake Aniwhenua, a man-made hydro lake on the Rangitaiki River. This is a quiet, pretty spot with a boat ramp and a playground for kids, and freedom camping is allowed here for a maximum of seven nights in any four week period. It’s administered by the Whakatane District Council, and there are toilets and a shower. There are a few motorhomes here, with the long weekend approaching. The camp site is #2820 in the NZMCA directory. After leaving Lake Aniwhenua, we arrive at Lake Matahina where the road takes us across the Matahina Dam on the Rangitaiki River, which marks the entrance to the Eastern Bay of Plenty. This dam is an impressive 86 metre high earth dam, and the largest of it’s type in the North Island. Both Lake Matahina and Lake Aniwhenua are very popular for recreational activities like boating, fishing and swimming. 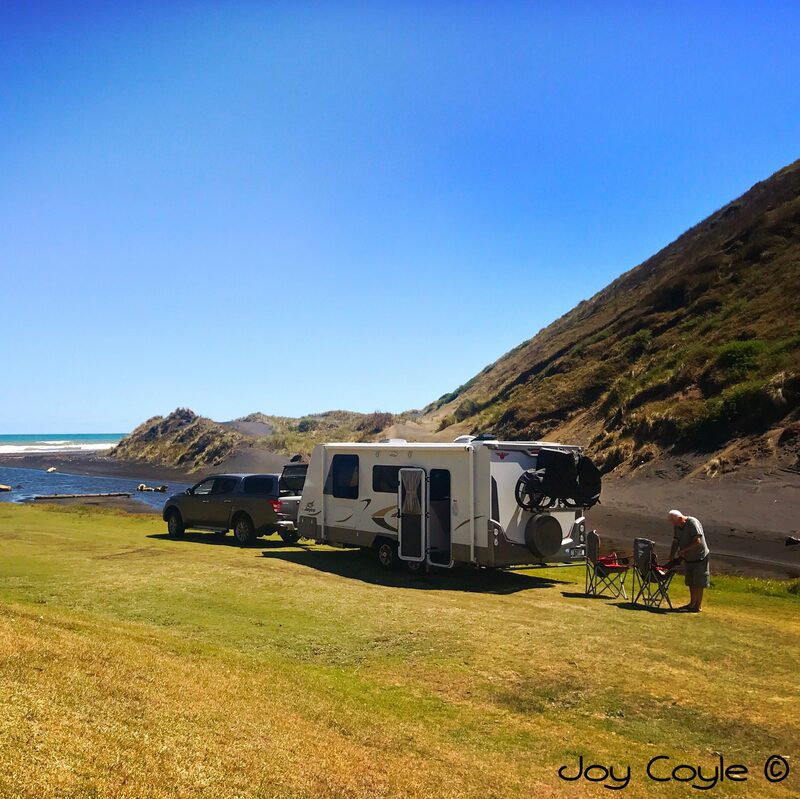 We reach Whakatane, where the weather looks beautiful for the weekend, and settle in with our caravan in our family’s drive. The playground at Whakatane Heads is popular. It’s Labour weekend, and summer has arrived. Over the weekend we decide to go and check out the Ohiwa Holiday Park with a view to booking a couple of sites over Christmas with the family. Getting there is a very pretty drive around the tidal Ohiwa harbour. We are fortunate that they have a couple of good sites still available together, so we book while we are here. Many people book ahead year after year not surprisingly, as we were impressed with the camp and facilities available. Continuing on to Opotiki, the road is lined with old pohutukawa trees which will be flowering in a few weeks, and looking fantastic. Shame we’ll miss them. They’ll probably be over when we get back here late December. Te Ara Ki Te Rawhiti – Pathway to the sunrise. These Pouwhenua (welcome poles), carved by Heke Collier, are unmissable as you approach the town. Opotiki is the northern gateway to the East Coast. I love this beautiful little church in the main street. It’s Hiona Saint Stephens Anglican Church. There are lots of interesting things to see and do here that warrant spending more time, including the Motu Cycle trails, Hukutaia Domain, Waiotahi Beach, and the museum. We don’t have the time today, but it’s been a taster to plan a return visit. We wanted to visit some relatives who live in Opotiki, a cousin of my mother’s who she was very fond of. We hadn’t seen them since Mum’s funeral nine years ago, and were pleased to find them home and in good spirits, despite some health issues and being older. Labour weekend over, it’s back to work and school for the family, so we check out our small granddaughter’s school classroom and watch her swimming lesson before we leave to travel to Mount Maunganui, where we have booked into the Mount Maunganui Holiday Park for a couple of nights. The Red Barn north of Whakatane was a good coffee stop on the way. We’ve secured a spot facing Main Beach on the ocean side, looking out on the boardwalk, which is always interesting, with Mauao, the mountain, behind us. There is a constant stream of people going past to walk up or around the Mount. Great for people watching. And you just can’t beat the beach view. We’re here just to chill and catch up with family and friends. I used to work at Tauranga Hospital so always love coming back and meeting my old work mates. Seeing a cruise ship arriving one morning was a bonus. The Port of Tauranga welcomes many cruise ships through the summer months and they make an impressive sight. There are plenty of cafes and restaurants just across the road, and the shopping centre is within easy walking distance with a variety of great shops, bars and more cafes and restaurants. The Mount Hot Pools are just next door and if you are staying in the camp admission to the pools is discounted. Mount Maunganui Main Beach and Pilot Bay on the harbour side are definitely destinations that draw the crowds, and beautiful places to hang out. Locals and visitors have been coming here for years and it’s reputation is deserved, but the downside is the traffic, and finding a parking space has become a bit of a nightmare. I have to say we were happy just staying put for a couple of days before heading back to Taupō. Beautiful pics as usual Joy. Many familiar scenes. Always an interesting read with wonderful pics.